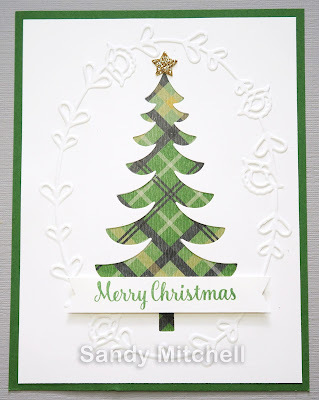 These cards can easily be made in an afternoon. 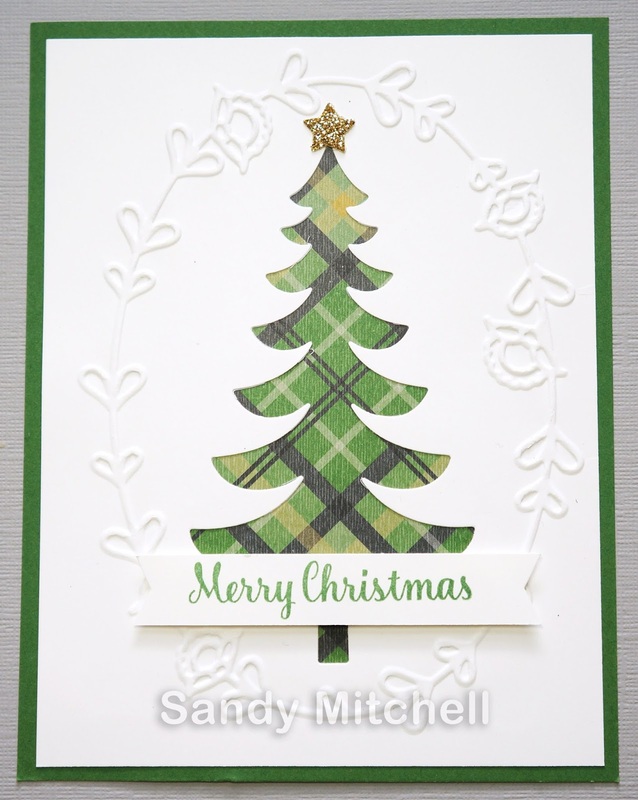 I was able to figure out Sandy's card, design the second card, stamp/cut and assemble them all in less than four hours. You should be able to do it way quicker, since I figured out the measurements for ya! 1 piece Gold Glimmer Paper 1" x 4"
Whisper White - cut both sheets in half crosswise (as you would for card bases). 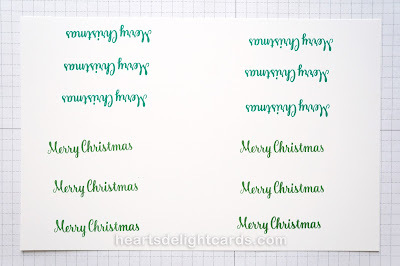 Set aside one half-sheet for stamping the greetings. The remainder should be cut down to six pieces 4" x 5-1/4". 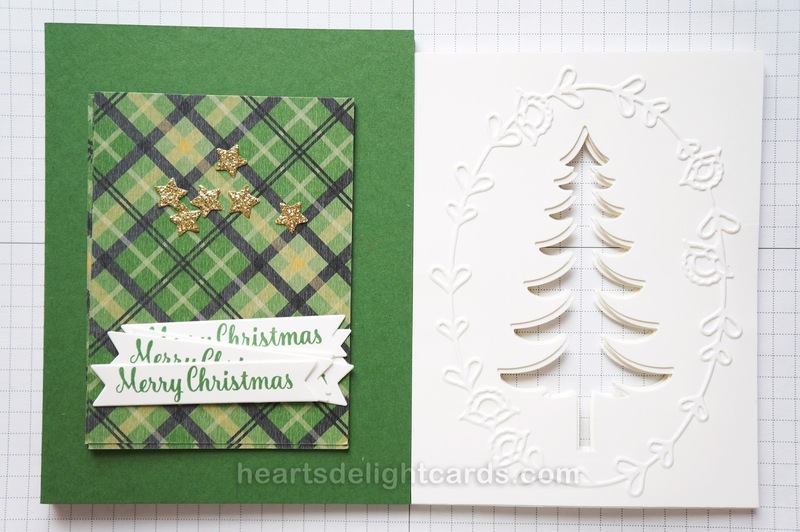 Garden Green - cut the three sheets in half crosswise, then score and fold the six pieces for your card bases. 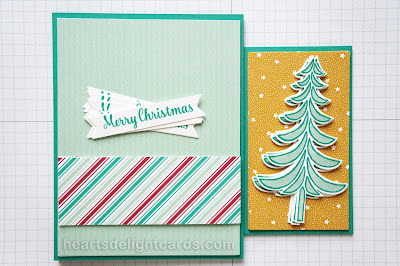 Warmth & Cheer DSP - for all three sheets trim 2" off one side (this will be leftovers). Rotate the remaining 4" x 6" and cut into halves to make six 3" x 4" pieces. 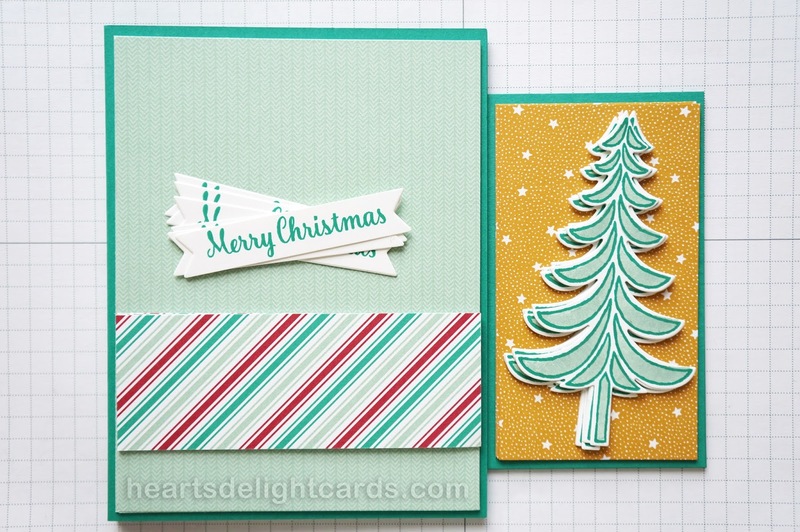 Set aside the paper you've cut so far for the first card. Emerald Envy - cut ONE sheet in half lengthwise (4-1/4" x 11"). Then cut six strips 2-1/2" x 4-1/4". (You will have some left over.) Cut and score the remaining three Emerald Envy sheets as you did with the Garden Green in Step 3. Cut the remaining two 1-1/2" wide DSP strips into six pieces measuring 1-1/2" x 4". Now on to Stamping and die-cutting! 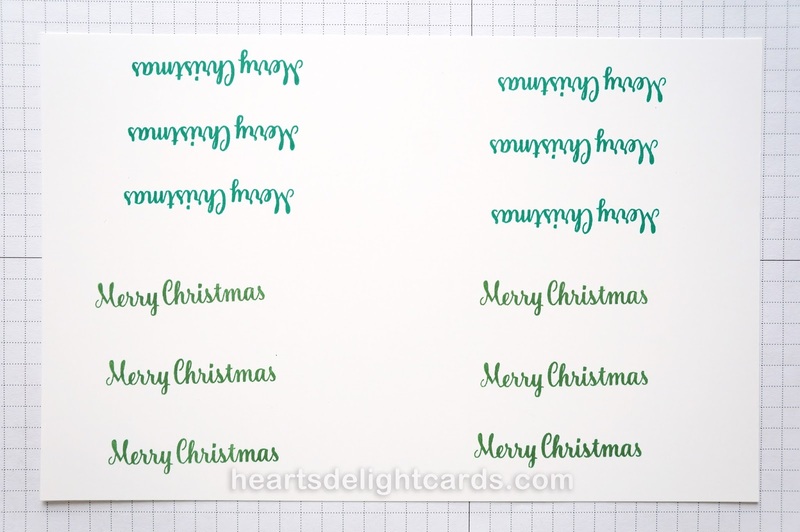 On the half sheet of Whisper White, stamp greeting six times in Emerald Envy and six times in Garden Green, making sure they are fairly evenly spaced. Cut them apart, leaving enough space around each greeting for the banner die to fit. 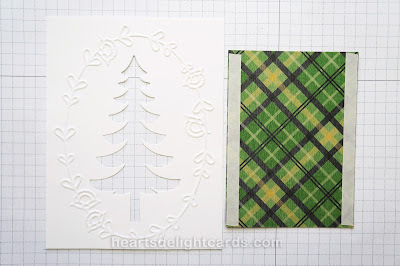 On the six remaining Whisper White pieces, stamp the tree from Santa's Sleigh in Emerald Envy ink, centering it with the bottom of the trunk about 5/8" from bottom of cardstock. 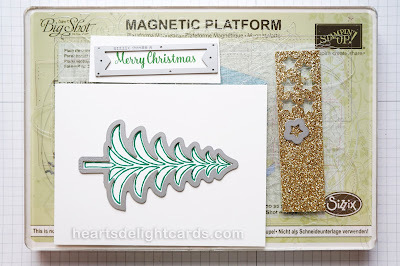 On the Magnetic Base Plate, place the stamped tree, Garden Green greeting, and gold glimmer paper. Line up the dies. You may need to shift them a bit so they are over a magnet. Run through the Big Shot. Set trees aside with the second card components. Emboss negative cut cardstock with embossing folder. Add adhesive to the long edges of the Warmth & Cheer DSP (I used Tear & Tape. You can use SNAIL, or liquid glue.) Adhere to back of tree opening, then attach both to Garden Green card base. Attach star at top with glue and use dimensionals to attach greeting. Now for the second card! Adhere smallest DSP strip to largest DSP, having bottom of strip about 1" from bottom. Adhere both to Emerald Envy card base. Color trees with Mint Macaron marker. Adhere tree to mat with a stripe of liquid glue down the length on back. 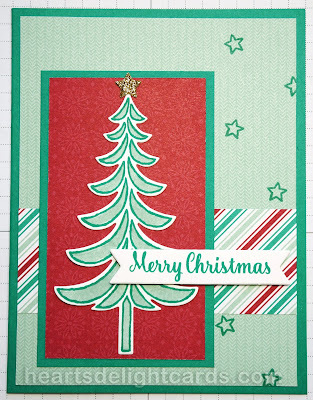 Die cut the Emerald Envy greetings and gold glimmer stars (do 'em together to save time). Glue star to top, and attach greeting with dimensionals. 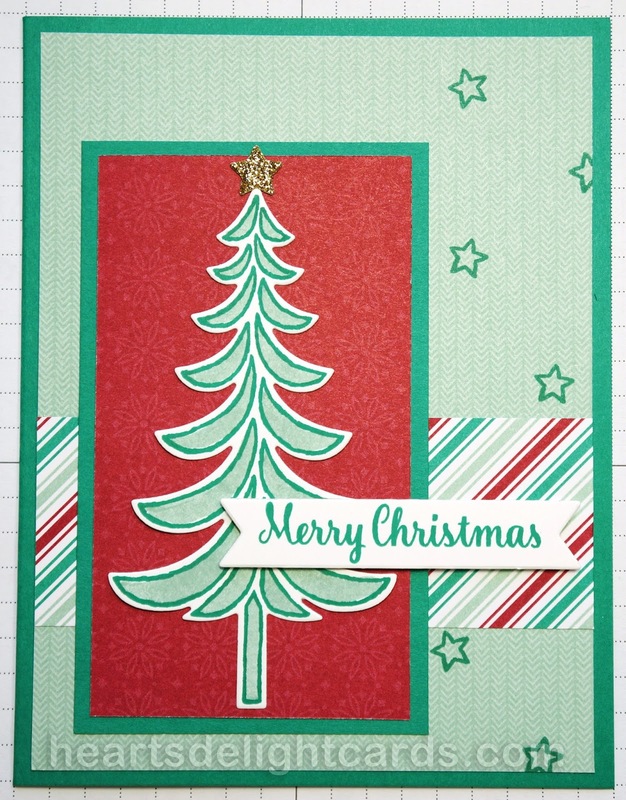 Stamp stars along right side with Emerald Envy ink. LAST CHANCE FOR A FREE GIFT! Happy Holidays from the Freaks! Attitude of Gratitude and a Sneak Peek! Balloon Adventures - Occasions 2017 Sneak Peek!